Designed by Elizabeth Zimmermann in 1968, this jacket remains a popular baby garment to this day. We have both the pattern and yarn available for purchase. This jacket knit in our very own Canadian alpaca yarn is sure to please. The lighter of the yarns pictured is an alpaca/merino/silk blend and the blue is hand dyed. It takes approximately 200 yards of each colour. This roving is super soft and is an 85% alpaca/15% merino blend. 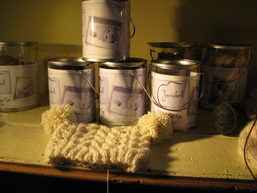 These kits include: 1 bar of soap, alpaca/merino fibre blend and instructions on how to felt the soap. Make your own cozy thrum mittens. This would also make a great Christmas gift for someone that knits. This kit includes brown alpaca yarn, 60 grams of white alpaca roving and the pattern. This kit includes a luxurious white lopi alpaca yarn and the pattern by Jwrobel. 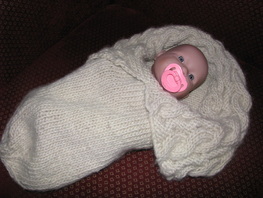 Sizing for Newborn(0-3 mos) and Baby (3-9 mos). The pattern includes complete instructions to knit this sweet cap in a gorgeous eco-friendly Canadian produced alpaca yarn. There are also multiple photos and links to helpful information about different techniques. Some knitting experience would be preferable. This kit includes luxurious alpaca yarn and the pattern by Jwrobel. Sizing for Newborn(0-3 mos) and Baby (3-9 mos). 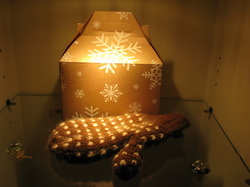 The pattern includes complete instructions to knit this hat in a gorgeous eco-friendly Canadian produced alpaca yarn. There are also multiple photos and links to helpful information about different techniques. Some knitting experience would be preferable. This kit comes packaged in a tin container.